Matt Gilman is the only visually impaired bike trials rider in the world. It wasn’t easy for Matt to rise to this level on his bike. He faced many challenges through his life, especially when he lost his eyesight at the age of 24. Matt has been a diabetic for 30 years. Matt moved to Baltimore at the start of his high school career. In the process of making new friends, he didn’t tell most of them about his being a diabetic. He was embarrassed of his diabetes. As a teenager, as many teenagers do, he thought that he was invincible. He decided to pretend not to have diabetes around his friends, this led to him eating poorly and missing insulin shots, which would ultimately damage his eyesight. When Matt was 24 years old, he noticed that his vision was getting blurry. He went to eye doctors, expecting to get glasses, but instead he was diagnosed as having the worst case of diabetic retinopathy that his doctors had ever seen. He went through 22 eye surgeries over a 2-year span. The most devastating part, Matt said, was that “I thought that I would never be able to ride a bike again.” Bike riding was his life and his passion. The idea of riding a bike again was almost impossible, unless he wanted to ride on the back of a tandem bike. Matt is and always has been a very independent individual. The thought of not having control of the bike and wanting to ride in his own way started to make him think outside the box. At that point he knew that he had to try to ride a bike the way he wanted to again. At that time he didn’t realize that he was going to have to start from scratch. Matt had to relearn the basics. He learned how to balance on a bike again, but this time he was learning how to do it without sight. Over time, things became easier. Maneuvering the bike became second nature and Matt was quickly getting back to the skill level that he had attained prior to losing his sight..
Matt created many videos of his riding after he got back on his bike. He wanted to show the world that vision is more than sight. If you are determined and willing to work hard, whether you are disabled or not, nothing will hold you back from achieving your goals and dreams. Matt is the example that anything is possible if you work hard at it. Because of Matt’s achievements on his bike, and his positivity, he shows that anyone can live their dreams. Matt has been featured in newspapers, magazines, podcasts, radio shows and television shows all over the world. 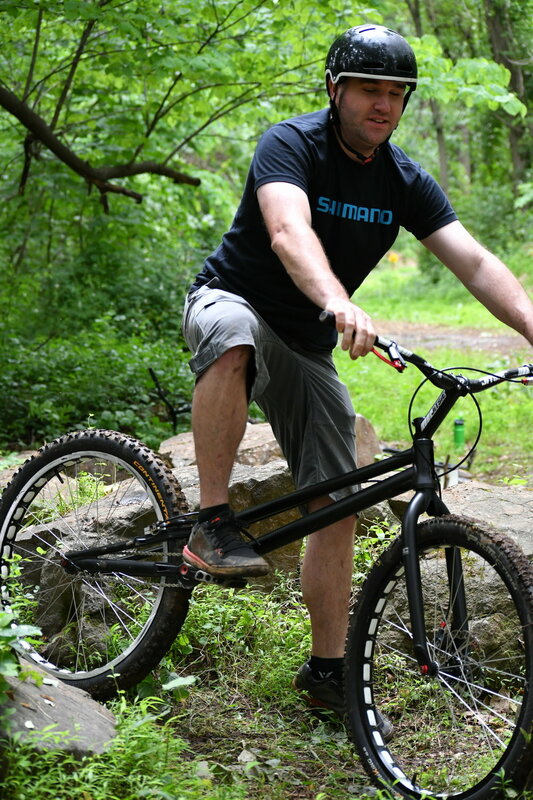 Matt has been doing bike trials demos and speaking in front of audiences for 10 years. He has shared his story and talents with a variety of audiences, from performing in front of elementary school students to speaking at corporate seminars.